Welcome to Souvenir Saturday. Today’s post is for blog reader “JG” he commented that he really likes the groovy old Disneyland shopping bags and he wondered if I had any. Well I do have one! It’s old and a bit wrinkled, but still scanned pretty nice. Should you desire the full resolution scan, you can download it here (link 4mb). Love this design! Do you know what year/range of years this design was used? How well I remember these bags. Of course I threw them all away. Arrrg! Oh, yes I remember them well, I believe I kept them for a while, THEN threw them away. Ugh. I've tossed a few as well Momma :( I may still have one from 1990 though. The tug-of-war between keeping stuff and have a "minimalist" environment is a bittersweet one for me. Minimalist meaning only keeping the cream of the crop and keeping them out where you can enjoy them. That's why I love Vintage Disneyland Tickets and other memorabilia sites - especially ephemera. I get to see it and love it but have to take care of it. make that DON'T have to take care of it. I've always wanted to make a desktop wallpaper of this design, but the pattern actually doesn't repeat as regularly as one might think. Disneyland bags were the #1 thing I saved for years....not so much any more....I'm interested to know what ones I have left....hum. One thing I can confirm is that that design of a bag was in use when I ever first visited Disneyland in 1971. And I have kept all the bags (Of any Disney park matter of fact!) over the years! I have some bags (slick-coated paper) and a jewelry box as well sporting that design, but I believe the colors are lighter. Will also have to check, but I would like to say that mine are from two trips to Walt Disney World in the summer of '72. Oh, man am I late to the party. THANK YOU THANK YOU THANK YOU THANK YOU THANK YOU THANK YOU THANK YOU THANK YOU THANK YOU THANK YOU THANK YOU THANK YOU THANK YOU THANK YOU THANK YOU THANK YOU THANK YOU THANK YOU THANK YOU THANK YOU THANK YOU. Doesn't express it, but it will have to do. 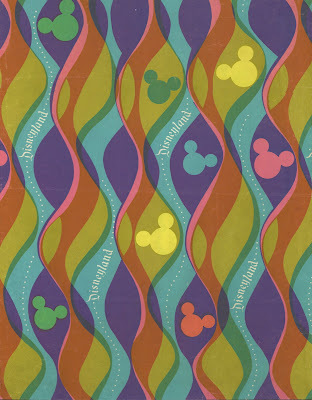 I love this pattern, it was the bag pattern for many years, all through my favorite period of disneyland and came to represent a kind of totem or backdrop of those years in my mind. A shirt, a shirt, please! A screen backdrop yes yes!